To decrease the number of spoofed email and spam you receive, you can add an additional layer of security on your inbound emails by enabling authentication with SPF, DKIM, and DMARC alignment. Domain-based Message Authentication, Reporting, and Conformance (DMARC) is a technical specification that allows email message senders and message receivers to cooperate and better detect when messages don't actually originate from the Internet domain they appear to represent. Sender Policy Framework (SPF) is a path-based email authentication technique. DomainKeys Identified Message (DKIM) is a signature-based email authentication technique. For more information, see SPF, DKIM, and DMARC. Important: Enabling this type of authentication can lead to a greater number of cases where emails from unsupported workflows may end up in your Suspended tickets view. Support tip: What does "Detected as spam" mean? The task of enabling SPF, DKIM, and DMARC alignment authentication is handled through the Email channels page. In Zendesk Support, click the Admin icon ( ) in the sidebar, then select Channels > Email. Scroll down to the section Sender authentication with DMARC. Select Enable, then click Save at the bottom of the page. Most emails that do not pass this type of authentication are suspended. You can view them in your Suspended tickets view. Tickets suspended for failing to pass SPF or DKIM authentication have Failed email authentication as the cause of suspension. After you enable this feature, it's important to regularly monitor your Suspended tickets view for false positives, valid emails from customers that are marked as spam. 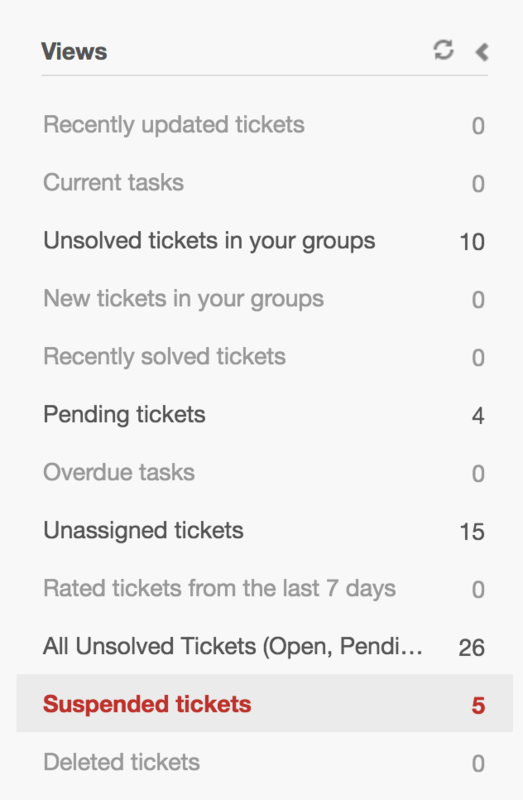 In Zendesk Support, click the Views ( ) icon in the sidebar and then click the Suspended tickets view. If you find that many valid emails are suspended, disable this feature and contact Zendesk Customer Service. It should be noted that if you workflow includes auto-forwarding email in to a Zendesk, the DKIM signatures may not be correct. Before enabling this feature, you might look at the "original message" in a few recent tickets, and ensure that emails forwarded to your zendesk do not have "dkim=fail" in the list. If they do, you'll want to reconsider how you get messages in to Zendesk before enabling this feature. Hi Allen, a DKIM failure on a forwarded email alone should not cause any change in behavior on our end. If that failure also included an SPF failure then there might be a flagged comment or a suspension, depending on whether it was a soft or hard-fail. "Most emails that do not pass DMARC authentication are suspended. You can view them in your Suspended tickets view. Tickets suspended for failing to pass DMARC authentication have Failed email authentication as the cause of suspension." If I understand correctly, if DMARC fails the email may be rejected instead of being 'Suspended'. Is there a way for these emails to never be downright rejected and always end up in the Suspended view? Some users do have SPF/DKIM set up for their domain but do not always send in emails the normal way, an example would be PHPmailer on a webserver with an IP address that is not covered by their SPF record. Basically, we want to manually review each message that does not pass DMARC authentication so we don't miss legitimate emails. When we identify those users, we'll just add them to the whitelist. Hi Hasan, Based on your description the arriving emails would become suspended. Only emails that purport to be from Zendesk.com might possibly be rejected. This policy can not be configured at the individual account level. Recovering or deleting from the suspended view is the only moderating tool available at this time for this purpose. Any change in this behavior would be a Feature Request.